Some music acts are so inextricably linked to a certain time and place that it's impossible for them to succeed outside their era. And in the early '90s, many of the artists that'd been huge in the '80s found the new decade didn't want them anymore - they were too much a part of the past. This week in 1993, a band whose extravagant style and MTV-friendly pop had come to define the early '80s defied expectations and made a major comeback. Meanwhile, a couple of dance acts that'd defined the sound of the early '90s found their time was already up. Whitney Houston's time at number 1 was also up, as Sonia Dada's already double platinum "You Don't Treat Me No Good" took over on top for a four-week stint. In its original version, this song featured on Technotronic's debut album. Remixed for inclusion on The Greatest Hits, it made the US top 10 in August 1992 and finally reached its Australian peak after re-entering in October 1993. Seemingly learning nothing from his "What's Wrong With That Girl" experience, Rick Price suffered another chart blow with this rocky fifth single from Heaven Knows. Prolific Austrian remixer Peter Rauhofer did much better with his work for other artists - he even won a Grammy for remixing Cher's "Believe" - than with his own dance tracks. Australians (mostly) had the good sense to enjoy this wobble board-featuring Led Zeppelin remake where it belonged - on ABC comedy series The Money Or The Gun. The Brits sent it into their top 10. Number 50 "Exterminate!" by Snap! Like Technotronic, the days of Snap! being a chart force in Australia were over, with this follow-up to "Rhythm Is A Dancer" scraping the very bottom of the top 50 - somewhere they wouldn't return for a decade, and then only with a remix of that hit. The first of two singles to feature Madonna backing singer Niki Harris, "Exterminate!" was a top 10 success across Europe, but its less commercial dance sound made it a hard sell locally. Another act whose solo singles chart success was more or less over was former The Police frontman Sting, with this lead single from his fourth album, Ten Summoner's Tales, continuing a downward trend by missing the top 40. The Grammy-winning song was actually my favourite Sting song since his run of singles in 1985, but with the exception of a big soundtrack collaboration at the very end of the year, his success would be limited to the albums chart from hereon in. Here's a dance act that was just hitting its stride, with this lead single and almost title track from second album No Limits! returning 2 Unlimited to the top 10 for the first time since "Get Ready For This". For me, this was the song with which the Belgian-produced, Dutch-fronted duo perfected their sound - and Europe agreed, sending it to number 1 across the continent and in the UK. In a year when I started going clubbing as often as I could, it also wound up as my favourite song for 1993. If there's one writer/producer who's defined pop music in the new millennium it's the seemingly ageless Pharrell Williams. But he started his behind-the-scenes career way before the '00s, writing part of this hip-hop classic by one-hit wonders Wreckx-N-Effect. Pharrell is listed as one of the song's multiple writers, although some of those credits are due to the sample-heavy nature of the track. His involvement with the tune is due to it being co-written and co-produced by his mentor at the time, new jack swing pioneer Teddy Riley, who also featured vocally on the song and whose brother, Markell, was one half of the duo. Between 1981 and 1985, they'd been unstoppable, racking up hit after hit around the world, including 8 top 10 singles on the Australian chart. But things had been going increasingly worse for Duran Duran since three of them reunited in 1986 after their side project-filled hiatus. 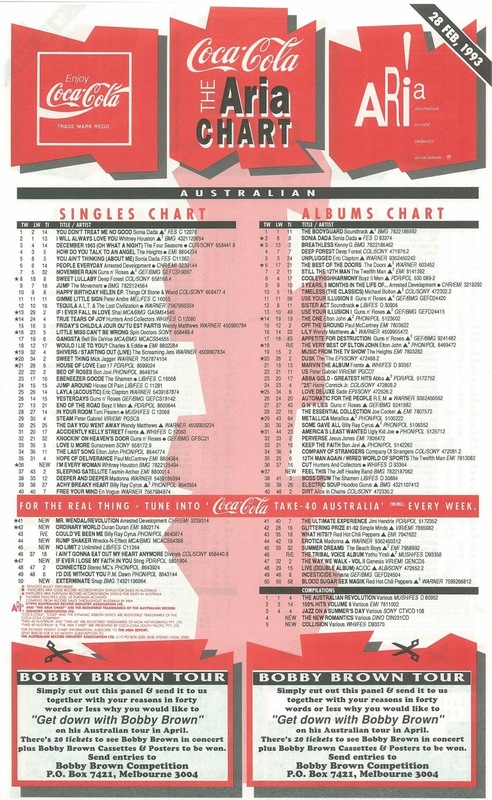 The lead single of their previous album, 1990's Liberty, hadn't even made the ARIA top 50. Was the globe-conquering band's success going to be relegated to the New Romantic era? Not if they had anything to do with it. In 1993, they came back with a vengeance. "Ordinary World" was the lead single from their second self-titled album, now commonly referred to as The Wedding Album due to its cover art - and its rock ballad feel perfectly fit into the music scene of the time. The more sombre sound wasn't completely out of the blue - Duran Duran had ventured into similar territory with "Save A Prayer" and "Do You Believe In Shame", although neither of those singles had performed very well in Australia. "Ordinary World" returned them to the top 20 for the first time since 1986's "Notorious", and took them back to the US and the UK top 10. "Ordinary World" shares another link with "Do You Believe In Shame". 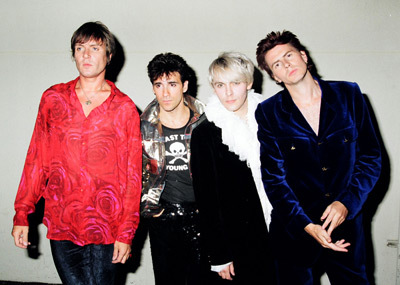 The two songs (as well as 1997's "Out Of My Mind") were written about the death of a friend of singer Simon Le Bon's. Less serious fact: like last week's "Sleeping Satellite", dance act Aurora turned the song into a trance/pop anthem seven years later. A second top 10 hit on the trot for Arrested Development with this double A-side release, which combined the third single from debut album 3 Years, 5 Months & 2 Days In The Life Of... and their contribution to the soundtrack of Malcolm X. The former, "Mr Wendal", raised awareness of homelessness, with Speech writing about the homeless people he'd encountered in Atlanta. Although there was no one Mr Wendal, the man who Speech most strongly associates with the song passed away before it was released and never got to hear it. "I Will Always Love You" might have dropped off the number 1 spot this week and The Bodyguard soundtrack might do the same the following week, but Whitney Houston had more hits up her sleeve, including this remake of the 1978 debut solo single by Chaka Khan, who Whitney namechecks towards the end of her version. Chaka, along with TLC, songwriter Valerie Simpson (of Ashford & Simpson fame), Weather Girl Martha Wash and Whitney's mother, Cissy, also appeared in the music video. Co-produced by Clivillés & Cole, "I'm Every Woman" was an antidote to mega-ballad "I Will Always Love You", which, like all massive hits, had started to rub people the wrong way. Next week: another cover of a '70s song makes a huge debut in the top 10, while an Australian band who'd recently visited the top 10 twice found themselves at the other end of the top 50. "No Limit" is my fave track this week, and I think it still holds up. A couple of my mates at school used to laugh at the line "I'm makin' techno and I am proud", and now I always think of that when I hear the song. Still, he is making techno and he is, in fact, proud. As he should be. Off the chart, I actually bought the remixed "Move This" single, and it was a bit punchier, but I still prefer the original. Come to think of it that whole album could do with a bit of a remaster and increase the levels so's we don't have to crank the volume way up. Get onto it, Jo Bogaert! I had totally forgotten 'A House Divided' until seeing its mention somewhere last year. And that Tina Arena appears as guest/back-up vocalist on it. I probably didn't recognise it as being her at the time, given she had seemingly disappeared off the face of the earth. I remember seeing 'Let Me Be Your Underwear' on an Adults-Only Video Hits special shown at about 2am around Easter '93. The disparity in chart fortunes between Australia and the UK for the Rolf Harris song perfectly illustrates my theory that the UK will lap up any old novelty rubbish. 'Exterminate!' was a bit too sparse, musically. 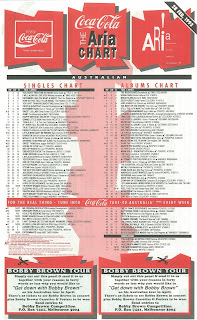 The Sting song was one of those releases that I'd never heard, or heard of, when it crashed into the chart. 'No Limit' was quite good. I wish I could see the "there's no lyrics" parody that aired on a British comedy TV show (not sure which one). It wasn't on YouTube last time I checked. I hated 'Rump Shaker' at the time, but have since grown to like it. The single version we got (as in Europe) was a different mix to the video embedded. 'Ordinary World' is one I was kind of ambivalent about at the time, but now really like it... though I think the next single was even better. I thought/read/heard (so it must be true) that 'Ordinary World' was actually about Simon Le Bon adjusting to not being a famous pop-star anymore (i.e. literally making it back to the "ordinary world"), and not even being recognised e.g. when shopping for groceries; if so, I love that idea for a pop song. Not a huge fan of 'Mr. Wendal'. I have never heard 'Revolution' before. People 'drag' Whitney's rendition of 'I Will Always Love You', but the next two follow-up singles, IMO, are probably more deserving of criticism. Like its predecessor, 'I'm Every Woman' seemed inescapable for a few months in '93.